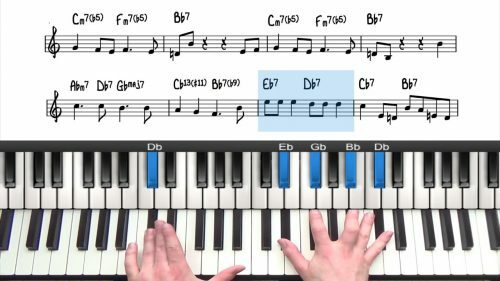 Building your knowledge of jazz piano chords is a very important skill and learning and memorising the common voicings will help you to read and interpret lead sheets. 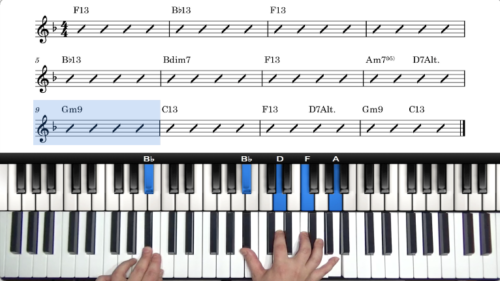 Most lessons come with downloadable PDFs containing the chord notation in all 12 keys. Enjoy! The triad is the basic building block of many different types of chord. Triads will more than likely be the first types of chords you come across. 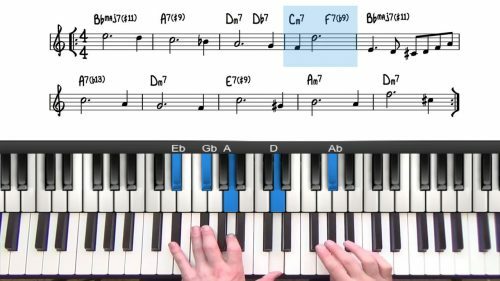 Most chords you will come across in jazz piano will be one of these five types of chords and so it’s important to understand their function. Each major scale contains 7 diatonic 7th chords. They are used to create common progressions such as major 251s and 1625 turnarounds. The Herbie Hancock voicing is a rich-sounding, two-handed minor 11th chord. Download the Herbie Hancock voicing in all 12 keys here. The ‘So What’ chord is a stack of three 4th intervals with a major 3rd on top. It’s a useful voicing over minor chords with the 5th in the melody. This is a supplement for the major voicings lesson. We outline a range of major voicings that can be used under each note of the Lydian mode. Learn to play sus chords and add suspended harmony to your arrangements. This document includes both basic and advanced applications. This is a supplement for the minor voicings lesson. We explore the different voicings that can be used under each of the 7 notes of the Dorian scale. 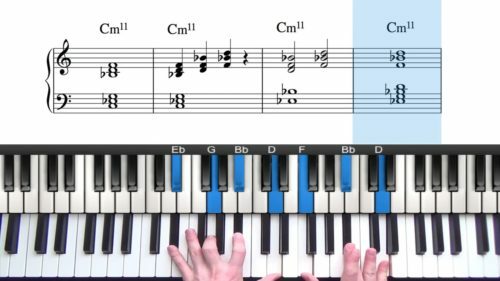 If you are completely new to jazz piano, there is a certain amount of ‘essential’ chord theory that you have to be familiar with. 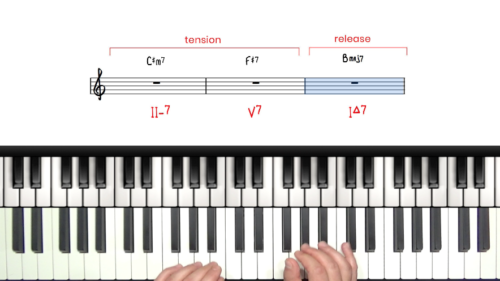 The 4 types of triad for jazz piano are the basic building blocks for 7th chords and other extended chords. You should be familiar and comfortable playing these triad shapes before moving onto other types of chords. 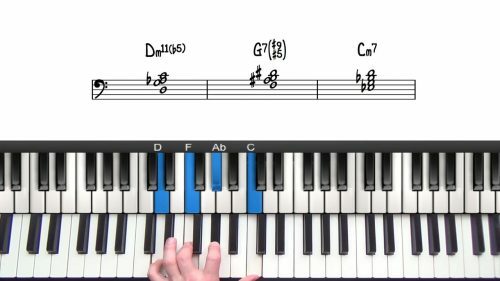 Next it’s time to learn the 5 types of 7th chords for jazz piano. 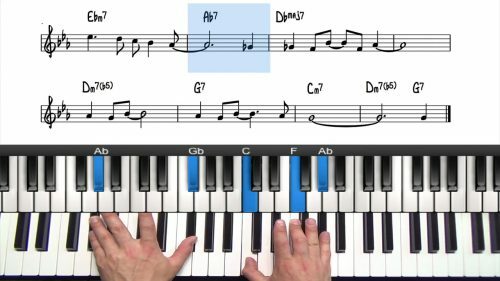 These 5 essential chord types make up the vast majority of chords you will come across when playing jazz piano. It’s important that you fully understand the construction of each. 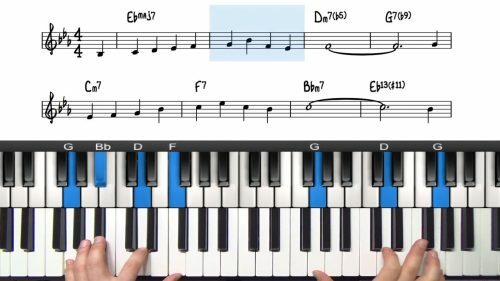 As a beginner jazz student, learning a selection of common jazz piano chords and voicings is a very important step. 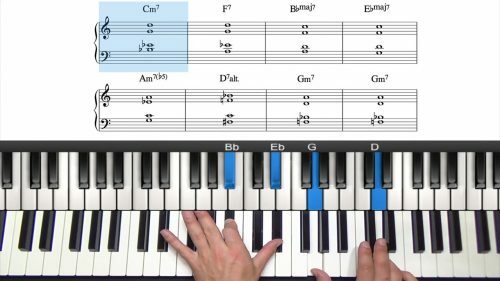 Firstly you need to understand the concept of jazz piano chord extensions. This lesson follows on logically from the lesson on 7th chords so make sure you check that out first. Extended chord contain chord tones that go past the 7th degree. For example major and minor 9th chords, 11th chords and 13th chords. This lesson gives you all the background theory and will get you playing your first extended chord voicings! Once you understand the theory behind chord extensions, you will be ready to build rootless voicings. 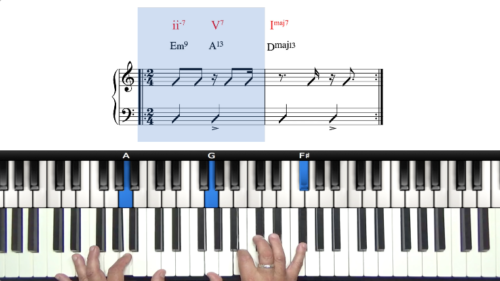 This is a very important concept to understand; we drop the root out of the chord and this frees up a finger for a more interesting and colourful note choice such as the 9th, 11th, or 13th. When playing in a jazz band or any situation where a bass player is present, the root note will already be covered and so there is no need for you to include it in your chord voicing. You also need to be comfortable playing rootless jazz piano chords for common chord progressions. See the lesson on the rootless 251 progression for more information. 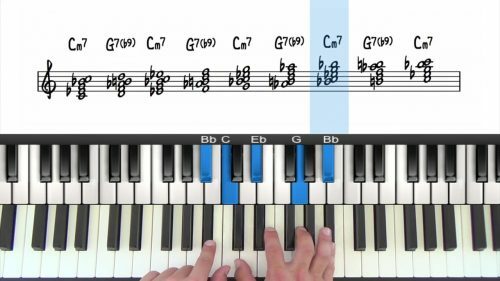 There are a number of common jazz piano voicings that you need to get under your fingers. Learning these common voicings will give you a nice selection of sounds and textures to choose from when playing through your favourite jazz standards. It’s important to always memorise the scale degree at the top of voicings. For example, the top note of the So What Chord Voicing is the 5th and so when you are playing a jazz standard, if you come across a minor chord (in any key) with the 5th in the melody, the So What Voicing will sound great and be a perfect choice of chord. In the same way, the Kenny Barron Minor 11th Voicing has the 11th on the top so this is a great minor voicing when the 11th is in the melody. The Herbie Hancock Chord Voicing Lesson has the 9th in the melody so this will be a good choice of voicing when you come across the 9th in the melody over a minor chord. In all 3 of the above lessons I demonstrate how to identify the scale degree of the melody note when playing through jazz standards. Always try to do this with any tune you are learning and your knowledge of voicings will increase massively. This is a functional approach to learning and memorising voicings. Instead of thinking in terms of note names such as ‘C’ ‘D’ ‘E’ etc… we are thinking functionally by memorising the scale degrees of these important voicings. The main benefit of this is that it gives you the ‘formula’ which you can then apply to any key. The free jazz chord lessons and practice materials on this page will teach you the foundations of jazz harmony. In the Pro Member tutorials, we explore much more complex types of chords and voicings. It’s strongly recommended that you are familiar with the basic concepts of chord extensions before attempting the more advanced topics such as upper structure harmony. 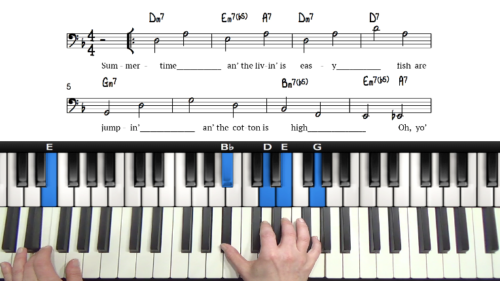 In the free jazz piano chord lessons, we focused mainly on major and minor chord voicings. We did touch upon some dominant chord voicings but we did not explore the concepts of alterations and extensions. Unlike major and minor chords, it’s very common to alter the extensions of dominant chord voicings. Adding alterations creates more tension and dissonance which adds interesting colour and strengthens the sense of resolution in a progression. 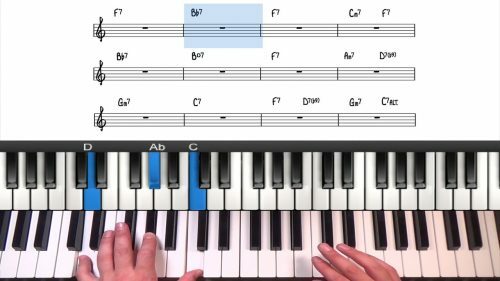 The lesson on altered jazz piano chords guides you through the first step in learning altered voicings. The 9th can either be sharpened or flattened to get the #9 or the b9. The 11th and 5th can also be sharpened to get the #11 and #5 (#5 is also known as b13). 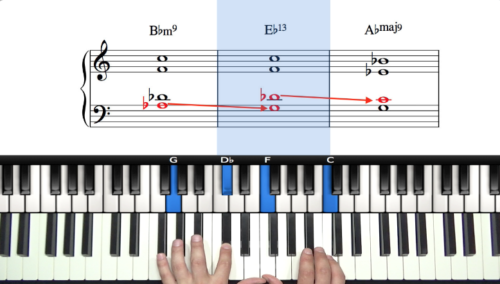 We start off by just altering 1 note in the voicing and then we look at altering more than one note to get combinations such as b9 #5, or #9 #5. Spend some time to experiment with these alterations in at least a few different keys. Once you are comfortable altering 1 or 2 notes of a dominant chord, it’s time to watch the upper structure triads tutorial. Understanding the concept of upper structures will help you learn the most important altered dominant chord voicings. By memorising a short list of formulas it will allow you to create complex altered dominant sounds by visualising the chord in two parts; the lower half containing the ‘essential chord tones’, and the upper half usually containing a triad. 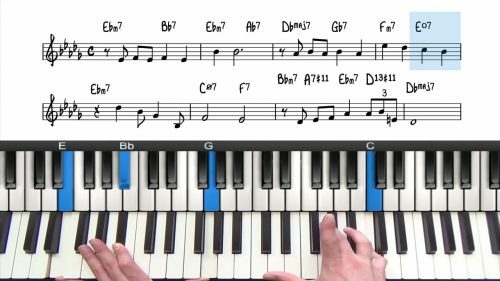 In this series of lessons, we also discuss how to practice upper structures, and then apply upper structures to the popular jazz standard ‘Blue In Green’. If you’re looking for a shortcut to take your playing to the next level, this is it! Upper Structure Voicings are usually applied to dominant chords but you can also apply this theory to major and minor chords. The premise is the same; you split the voicing into two parts and visualise each part as a separate entity which creates a bi-tonal chord voicing. Bitonality is when you are effectively hearing 2 different chords ringing out at the same time. An example would be a D major triad played over a C major seventh chord. This creates a CMaj13#11 sound as the D Major triad becomes the 9th, #11th and 13th of C Major. For more information on this style of voicing, check out the lesson on Major & Minor Upper Structures. The ‘Four Way Close’ is a distinctive style of chord where the voicing is built in closed position, directly below the melody. Block Chord Voicings are generally played in rhythmic unison with the right hand and work particularly well for stepwise melody lines. If you are new to Block Chord Harmony, the first step is to learn how to play the four way close which was popularised by musicians such as George Shearing. 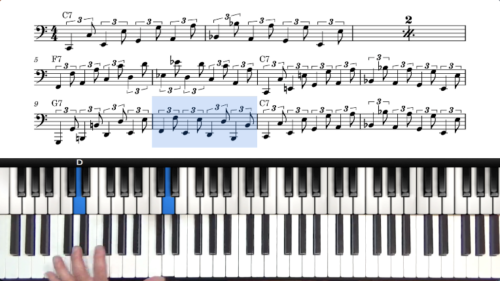 The four way close has the melody on both the top and bottom of the voicing. Block chord styles continued to develop and the Red Garland Voicingis testament to this. Red Garland Voicings create a much fuller block chord sound with a brighter and cheerier quality. This is achieved through doubling the melody in the right hand and adding a note a perfect fifth above the bottom note in the right hand. Unlike previous styles of block chords, Red Garland did not change his left hand voicing until the chord changed. Sus Chords or Suspended chords are a type of dominant chord voicing where the major 3rd has been omitted and replaced by the 4th. There are some instances where you can voice both the major 3rd and suspended 4th in the same chord. 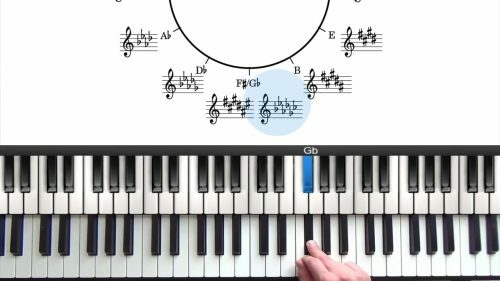 However, it’s much more commonly used to delay the sense of resolution by adding more movement and interest over the 5 chord. 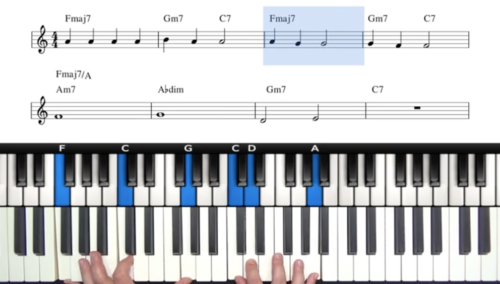 If this concept is new to you, check out the lesson on how to play sus chords for jazz piano. 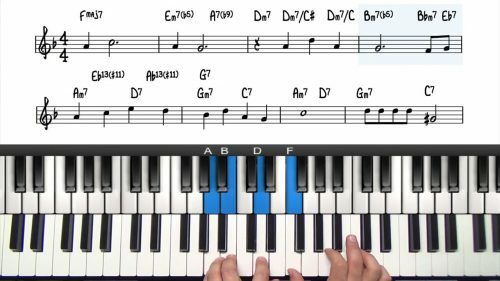 Most of the jazz piano chord lessons include a downloadable PDF file containing the notation in all 12 keys. Whilst these PDF files can speed up the learning process, try not to become overly reliant on the notation. Remember that it’s important to memorise the formulas for the voicings in terms of scale degrees. This will then give you the ‘blueprint’ to construct the voicing in all 12 keys. 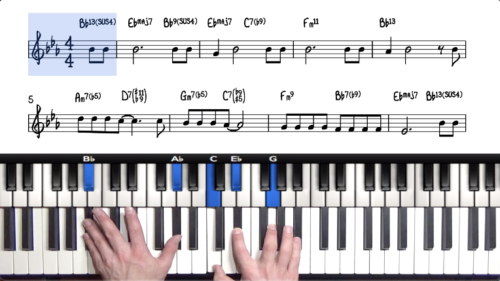 As a pro member you have access to a number of jazz piano chord charts and cheat sheets. These documents contain important formulas for constructing upper structure triads. It’s useful to keep these charts near to the piano so that you can use them for reference when playing through jazz standards. 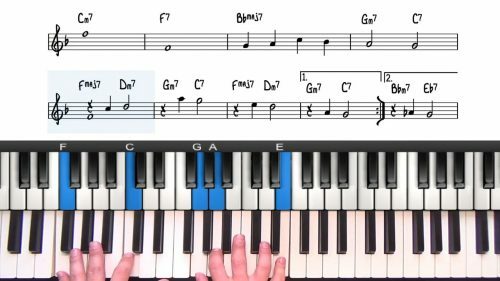 If you’re new to jazz piano… start here! These lessons cover the foundations of jazz theory including scales, triads, 7th chords & the mighty 251 progression. We explore the chord voicings, baselines and rhythms and then we add these 3 components together to create our first Bossa Nova groove. 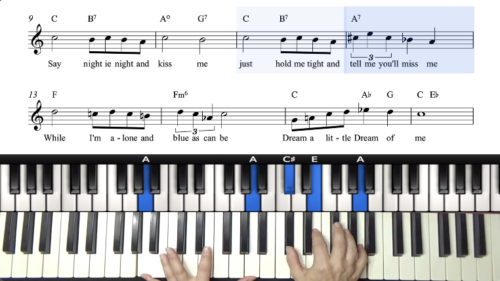 Extended chords are one of the hallmarks of jazz piano. We explore some useful extended chords and apply the voicings to 4 jazz standards. In this course, we will explore the groove of Brazilian music. Taught by master pianist, composer, arranger, & educator – Jovino Santos Neto. An in-depth study of rootless chord voicings; we create rootless 251 progressions in major and minor keys & apply to 3 well-know jazz standards. Jovino’s 5-Minute Masterclasses tutorials are short, concise, and actionable lessons covering jazz and music theory with a Brazilian twist. If you’re looking at this course, there’s a good chance it’s because you’ve heard boogie-woogie, and it immediately lit up something inside you. Welcome. A selection of well-known festive arrangements. Share these jazzy Christmas tunes with your friends and family over the holiday season. “How To Accompany Singers” is a vocal accompaniment course taught by Lyndol Descant – singer, jazz pianist, and composer based in Brooklyn, NYC. The “5 Minute Masterclass” is a series of short & concise tutorials. 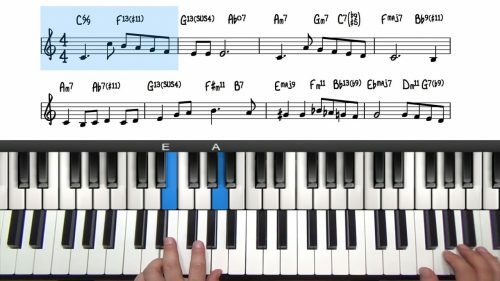 PianoGroove Teachers share tips & tricks that took us years to figure out. In this course, our vocal expert Lyndol Descant shares her tips, tricks, and secrets for playing singalongs over the most famous Christmas tunes. This course explores the altered chord tones: b9s, #9s, #11s, and #5s / b13s. We then create upper structure triads and apply to 4 famous jazz standards. Chord substitutions allow you to add interesting variations to a common progression. We explore tritone subs, suspended chords & passing chords. Learn how to sing and play jazz standards with Lyndol Descant. Lyndol is a singing pianist, composer, and educator based in Brooklyn, NYC. In this course we explore a range of voicings for major, minor and dominant chords. This will help you build full, solo piano arrangements. Chords and scales share an intimate relationship. 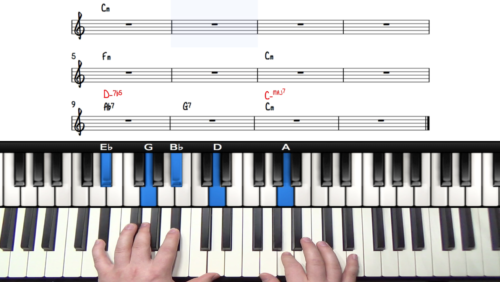 All chords imply a scale, and these scales are used extensively for jazz piano improvisation. We explore slash chords, cluster voicings and upper structure triads variations to then apply these voicings to 5 well-known jazz standards. Introductions are used to set the mood of a performance. We explore the theory and formulas and create killer intros for a number of jazz standards. Learn advanced jazz piano theory with one of NYCs finest jazz piano players. Tuomo shares his insight on chords, scales, progressions, & improvisation. In this 6 lesson course, we’ll explore Tonal Harmony & Related Dominants with a unique approach to improvising over the Dominant – Tonic relationship. This course covers walking bass, blues and gospel inspired jazz standards. We introduce the major blues scale to add soulful licks to your arrangements. This course contains intermediate to advanced level jazz standard arrangements. These arrangements are all for solo jazz piano performance. This course covers the foundations of jazz improvisation. We explore scales, arpeggios, chord tones, enclosures, approach patterns & swing rhythm. Block chords and drop 2 style voicings were used extensively by jazz pianists such as George Shearing, Bill Evans, Barry Harris and Red Garland. 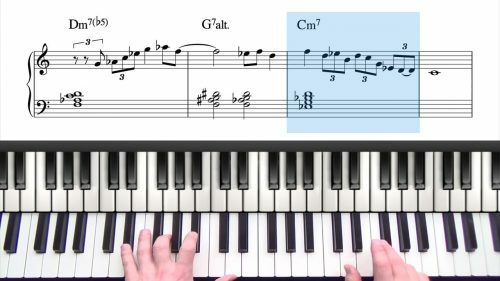 Diminished Harmony is a huge area of study for jazz piano. 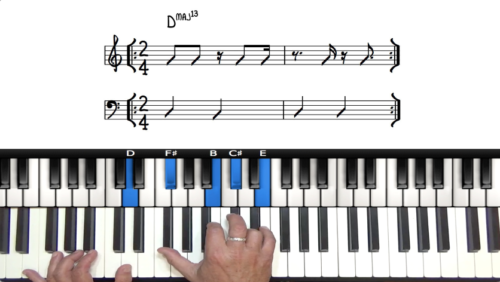 Diminished Scales are versatile scales that are used extensively in jazz improvisation.